Hand Crafted Heirloom Furniture, built in New York, U.S.A. There's few styles of furniture that have maintained their status of being popular for over two centuries, as well as Shaker Furniture. The clean simple lines make for a wonderful backdrop to show off beautiful woods, and superior workmanship. If done properly, a Shaker piece is a work of art, that can fit into any decor, from post and beam, to today's most modern homes. This Shaker lowboy chest of drawers is such an example of pure Shaker design. Through the 1980s, Shaker furniture hit an almost fad frenzy. Most manufacturers of the time were quick to jump onto the Shaker band wagon. Most tried to incorporate Shaker into "their own" styles, resulting in Skakerized Country, Colonial, you name it! Dad recognized that A. the furniture that the Shakers built was beautiful, and B. our clients were asking for the most authentic looking and constructed pieces possible. We had an influential client that arranged a private tour of the Hancock Shaker Museum in Pittsfield, Mass. We were allowed to view the furniture, including dozens of pieces up on the 3rd floor that were in different states of repair. We were given the gift to film many pieces, opening doors and pulling out drawers! 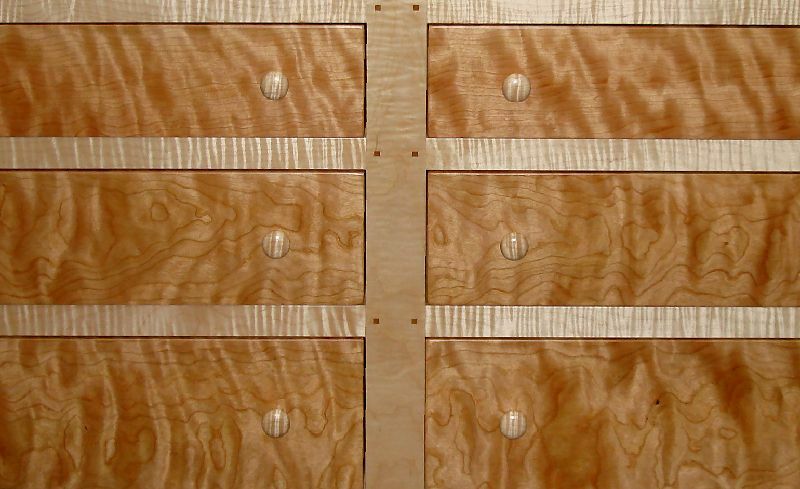 Since the earliest Shaker pieces Delnero Furniture Company built, we have maintained this unique furniture's design and methods of construction. 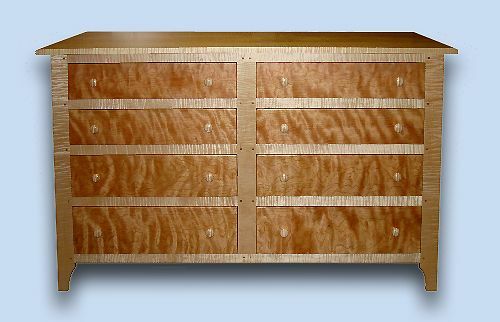 A shot of the heirloom tiger maple case, and matching heirloom flame cherry drawers. The stiles and rails are pegged with 3/8" square cherry pegs. The hand turned Shaker knobs were lathed out of the same pieces of wood that the divide rail were crafted of. 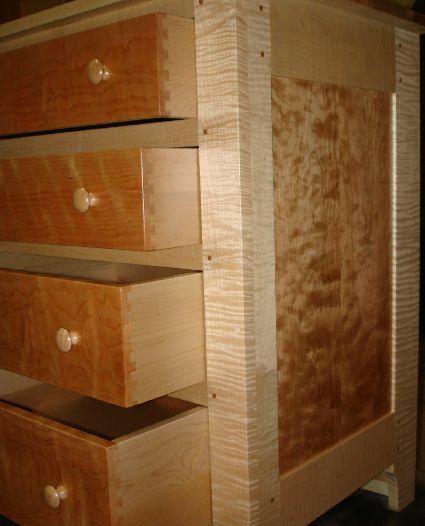 The dovetail drawers run on traditional wooden drawer runners. 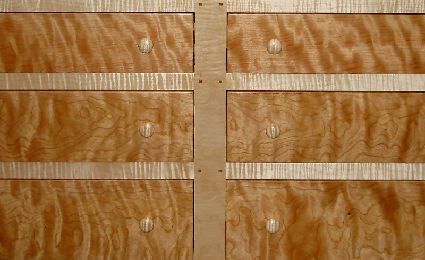 Click on this image to enjoy a larger view of the figured hardwoods used in this chest of drawers.